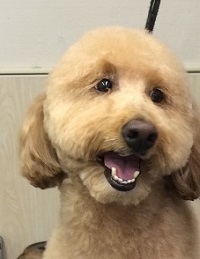 We are a dog grooming salon in downtown Santa Barbara, dedicated to your pet's grooming needs. Whether you have a pug in need of a bath or a poodle that needs some extravagant styling, we are at your service. We are conveniently located less than a block from the ocean in the Santa Barbara Funk Zone (see our MAP page) & within close walking distance to many restaurants, wine tasting rooms, the pier, harbor & yacht club. You can enjoy a nice meal, go wine tasting or check out the latest art shows while we pamper your pets. With ten years of experience your pups will be in the most caring hands. The Basic Groom Package includes all of the above plus your choice of customized or breed specific haircuts. We use only the purest organic & non-toxic products!